GRIEF: Anisha Maraj cries as the body of her husband Pundit Sunil Ragbirsingh leaves for the Waterloo cremation site. PHOTO BY VASHTI SINGH. Expressing their anguish over the murder of one of their religious leaders, pundits are calling for guns to protect themselves from criminal elements. 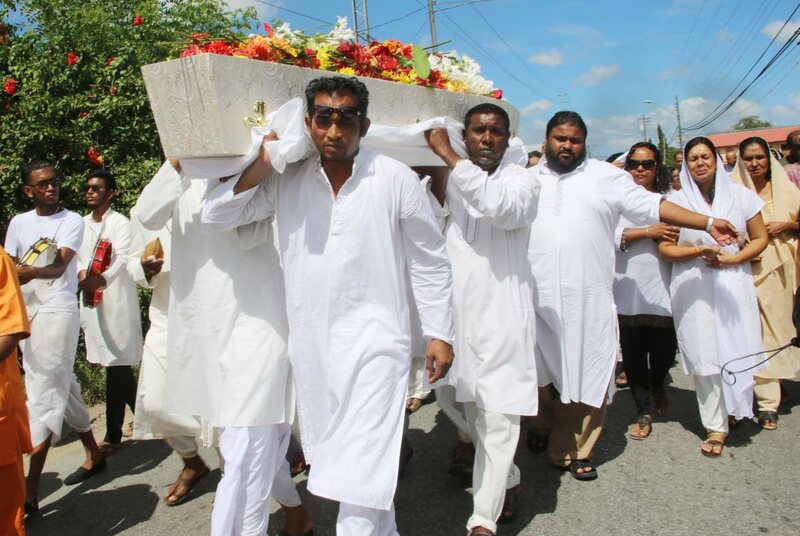 Seepersad was one of 20 pundits who spoke at the funeral for Pundit Sunil Ragbirsingh who was shot and killed at his Arouca home on Saturday night. The funeral was held at Calcutta Road #2 in Freeport yesterday morning. Many of the pundits told mourners they felt angry and hurt. “If the State cannot get rid of the guns from the criminals, then give a licensed gun to each one of us to protect ourselves,” Seepersad said. He told pundits they were not sheep, but lions among men. Ragbirsingh returned to his First Street, Five Rivers, Arouca home at about 11pm after a prayer service at an Endeavour, Chaguanas temple. He was confronted by three men, with bandanas over their faces, who were leaving the house after removing a safe containing a large sum of cash and jewelry. He was shot by one of the bandits as they fled. Relatives found Ragbirsingh’s body in the garage. Pundit Bissram Seeudath described Ragbirsingh’s death as an assassination. Many of the pundits who spoke struggled to hold back their tears. “This is such a tragedy, said Pundit Robby Roopnarine. ”I am sad and devastated. I remember his (Ragbirsingh’s) smile. He was a hero to many.” He said he and other religious leaders can take solace that Ragbirsingh accomplished what he set out to do, through his community and other communities, bringing families closer to God. MP for Couva South Rudranath Indarsingh asked the question, “Who is next to be killed?” He said Ragbirsingh is the third member of his constituency to be killed over a two month period and it is clear that the government has lost the battle against crime. Ragbirsingh was cremated at the Waterloo Cremation Site. No arrests have been made in his killing. Reply to "Pundits call for guns"